Just 83 days (including today) left. Gov. 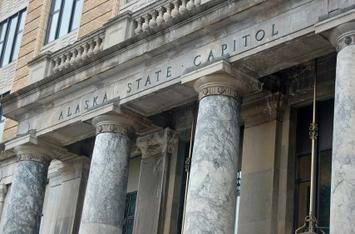 Michael J. Dunleavy is expected to give his State of the State address tonight at 7 p.m. The whole issue is complicated by the fact the House is still without a permanent speaker to invite everyone to a joint session in the chambers. While there’s questions about the mechanics of the invitation, it sounds like everyone’s confident that something will be worked out whether it’s a vote to suspend the uniform rules on the floor or a letter signed by legislators, similar to the one that kept the staffing agreements in place. All that aside, after dodging many public appearances during the final months of the campaign, it’ll be the first and hopefully clearest look at just what Gov. Michael J. Dunleavy plans for the next four years. The House Republican “Majority” held a news conference on Monday morning where Rep. Dave Talerico kicked things off by announcing that there was, in fact, no organization, no real news on the organization and that here’s looking forward to organization sometime soon, maybe. The only real, somewhat substantial news out of the meeting was Republican “Majority” co-chair of Finance Rep. Tammie Wilson’s plans to hold some committee-like meetings this week as the normal committee process can’t get rolling whatsoever until a permanent speaker is elected. Revenue is set to be heard 1 p.m. Thursday and a Resources hearing sometime on Friday. The other takeaway being the acknowledgement by Wilson that a 90-day session is probably going to be difficult to hit thanks to the radical changes expected in the Dunleavy budget, which also isn’t expected to land in legislators’ hands until midway through February. She said it’ll allow for other things to be considered in the meantime, but it’s an acknowledgement that the new process will really put the crunch on legislators this year (and remember, legislators won’t get per diem after day 121 if they haven’t passed a budget). Today’s day 8 of the session, which means the Legislature’s uniform rules require temporary speaker Neal Foster to call for the nominations of a permanent speaker. We don’t expect any of those to have the necessary 21 votes to actually win, but it’ll be something. The House is due in at 10 a.m. While the House is still meandering around its organization, the Senate is getting underway with nomination hearings this week. It’s kicking off at 9 a.m. with the Senate Finance Committee (holding a joint hearing on Department of Administration Commissioner John Quick with the Senate State Affairs Committee and then a solo hearing of Department of Revenue Commissioner Bruce Tangeman). The Senate Labor and Commerce Committee will be meeting at 1:30 p.m. to hold the hearing for Department of Commerce, Community and Economic Development Commissioner Julie Anderson. It’s super early for the Legislature to already be holding these hearings. They’re usually a mid-session sort of diversion with the big joint confirmation floor session coming toward the end of the session. There are more hearings scheduled for the rest of the week, too. It appears they want to get things wrapped up sooner than later. That’s a line from Alaska Public Media’s report on how policies in Alaska’s prisons are changing under Gov. Michael J. Dunleavy and his administration. The Department of Corrections has suspended special access volunteer badges, a 12-hour day pass program for inmates (which reportedly violated the rights of victims to be notified of offender release) and the rejection of a $1 million federal grant for re-entry programs. Corrections Commissioner Nancy Dahlstrom talked a lot about public safety in the changes, particularly for the volunteer badges, but was reportedly unable to cite specifics. It just so happens that Gov. Michael J. Dunleavy’s budget director Donna Arduin knows a thing or two about private prisons. It apparently took longer to compose this tweet, than it did to complete a technical session in the Senate. No pledge, no prayer, no journal certification, no messages from the governor, no messages from the House, no special orders. Seven senators here. A technical session. Just here to see what that’s like. A formality really #akleg and we’re adjourned. Be the first to comment on "AKLEG Recap Day 7: House gets to ‘work’ with informal meetings"